And they devoted themselves to the apostles’ teaching . . .
For those who serve well as deacons gain a good standing for themselves and also great confidence in the faith that is in Christ Jesus. There is no mandate in Scripture for the congregational “Amen,” but there is something more profound—maybe even theological—about this twofold witness to God’s Word. Throughout the New Testament, wherever the Word is preached, it is brought by multiple witnesses. For instance, when Jesus sent out his disciples to proclaim the gospel of the kingdom, he sent them out “two by two” (Luke 10:1). Jesus’s own ministry included the witness of John the Baptist (John 5:30–46), and when Jesus described the church he established it on the basis of two or three gathered together (Matthew 18:19–20). In all, there is a pattern in the New Testament that the proclamation of the Gospel is carried by two or more witnesses. Perhaps this is a pragmatic decision to increase the psychological confidence of God’s witnesses, but I suspect it is more a function of legal testimony. Just as the Spirit vindicated Jesus through his resurrection (1 Timothy 3:16), those who bear witness to the justification that comes through faith in the resurrected Christ bear legal testimony to God’s work. This idea of legal witness goes back to the Old Testament, and the need for two or more witnesses in court (Num. 35:30; Deut 17:6; 19:15). In the New Testament, as the Spirit formed the church, we find a repeated emphasis on paired witness. For instance, Peter and John stood on trial together before the Sanhedrin (Acts 4:13), and the church at Antioch commissioned Barnabas and Saul to bring the gospel to Asia Minor (Acts 13:1–3). All in all, few are the instances where individuals testify of Christ by themselves. Even Jesus stood to Stephen’s defense as preached his last sermon (Acts 7:55), and the Spirit bore witness to apostles’ message when he was poured out in Jerusalem (Acts 2), Samaria (ch. 8), Cornelius’s house (ch. 10), and Ephesus (ch. 19). In other words, the consistent testimony of New Testament witness is brought by multiple voices—human and divine! Going further, paired witnesses, expressed in a variety of ways (e.g., apostles and prophets, apostles and elders, etc. 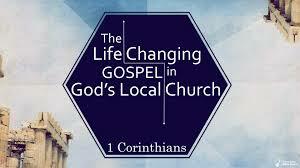 ), occur throughout the New Testament, landing eventually in local churches (e.g., elders and deacons). Because elders and deacons are the two ongoing offices in the church (cf. Philippians 1:1; 1 Timothy 3:1–13), we must consider what Scripture says about them. Still, even before looking at all the specifics, we should observe how these offices relate to the gospel itself. Both are formed by the gospel and are created in order to proclaim (elders) and prove the gospel (deacons). While the first statement, elders preach the gospel, is rather self-evident; it is the second statement, deacons prove the gospel, that needs clarification. In 1 Timothy 3:13, Paul says that when deacons serve well they gain great confidence for the gospel. This is how deacons prove the gospel. Sitting in the congregation and serving throughout the church, deacons put on display (i.e., they prove) what the gospel does to a person. In their actions they model faithfulness to Christ; such faithfulness spurs others on towards love and good deeds and it overturns arguments against the gospel. Accordingly, as our church continues to think about elders and deacons, I want to make the case that elders and deacons serve as a dual witness to the power of the gospel. While the elders stand to proclaim the Word in the public gathering of the church, deacons serve as models “in the crowd” who proclaim “Amen” to the gospel message by their faithful lives and service of good works. Gospel truth as spoken message is confirmed and even “seen” by means of a rightly ordered church polity. When qualified elders (1 Timothy 3:1–7) are joined by qualified deacons (1 Timothy 3:8–13), the plausibility of the gospel is heightened and the possibility of congregation-wide good works is strengthened. Moreover, the life-transforming message of the gospel is seen by unbelievers who come in contact with the church. For this reason, it is important to see why the elders preach the gospel and gospel-centered churches install deacons who hold fast to the faith. As 1 Timothy 3:13 puts it, “For those who serve well as deacons gain a good standing for themselves and also great confidence in the faith that is in Christ Jesus.” While deacons do not teach the gathered church, their presence and position in the church strengthens the preaching of the Word and is a necessary part of a growing gospel witness. May the Lord raise up elders and deacons in his church, and may the gospel’s message be amplified by their service. ← Where Do Elders Come From?